Digitization efforts and web presentations are currently on-going in many museums, archives, libraries and culture heritage institutions in general, exploiting the advent of WWW and digitization technologies. The main benefits from these efforts are exhibit cataloguing, their effective management, preservation and showcasing, and their presentation to the public through the WWW. However, many museums, especially the smaller ones, cannot afford a commercial product and resort to using simple static web pages for their web presence and exhibit presentation. Content Management Systems (CMS), especially open-source ones which come with practically zero-cost, are more and more frequently adopted by museums to create and maintain their website, since they simplify the creation and editing of the web pages and may be used by non-computer experts. 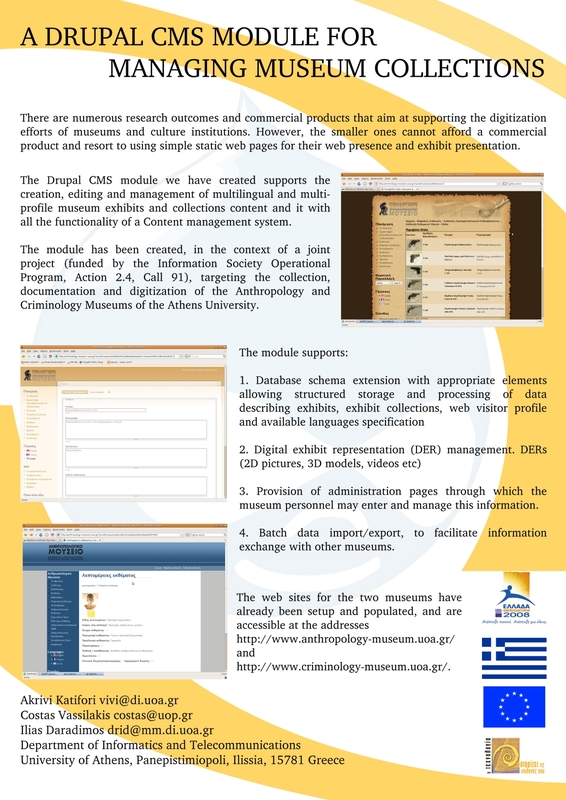 In this work we present a module for the Drupal CMS, which provides functionality for (a) Database schema extension to accommodate museum exhibit and collection information (b) Digital exhibit representation (DER) management. (c) Provision of administration pages through which the museum personnel may enter and manage exhibit and collection information (d) WWW scowcasing and (e) Batch data import/export, to facilitate information exchange with other museums.